CSWD provides a variety of services to help businesses in Chittenden County understand what the law requires of them and assist them in reducing and managing their solid waste effectively. Contact the Business Outreach Coordinator to discuss your business and see how we can be of help. We’ll review the solid waste laws and requirements for businesses operating in Chittenden County. This is a good place to start for new business owners, general managers, and facilities operations supervisors. 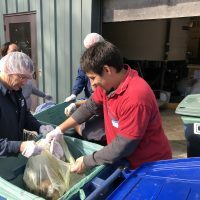 CSWD offers a range of resources and services – most at no charge – to help businesses in Chittenden County manage their waste streams responsibly. Conditionally Exempt Generators can bring their hazardous waste to the CSWD Environmental Depot. Plastic film can be recycled through a specialized program if you generate large quantities of pallet wrap or other unprinted and label-free plastic film. 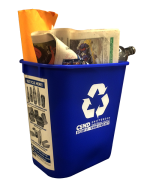 Other large quantities of materials that are not accepted in the blue bin may be recyclable through a specialized program. Contact us to see if it can be recycled. The Reuse Marketplace is a free business-to-business service that facilitates the exchange of reusable commercial materials. Get in touch using the contact form below. We’ll get back to you as soon as we can!